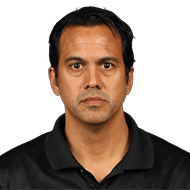 Erik Jon Spoelstra (/ˈspoʊlstrə/ SPOHL-strə; born November 1, 1970) is an American professional basketball coach who is the head coach for the Miami Heat of the National Basketball Association (NBA). Of Filipino descent from his mother's side, he is the first Asian-American head coach in the history of the four major North American sports leagues and the first Asian-American head coach to win an NBA championship. 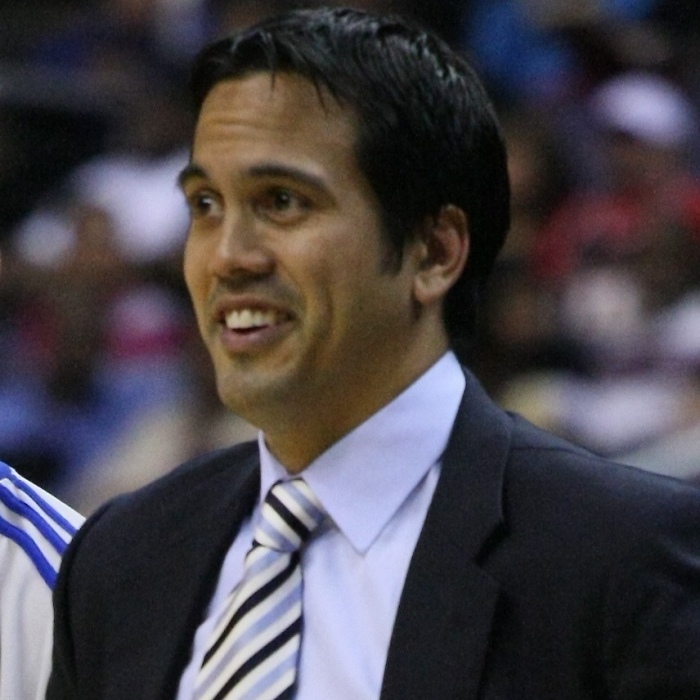 From 2001 to 2008, Spoelstra served as assistant coach and director of scouting for the team. Thereafter he was promoted to head coach. Prior to the 2010–11 season, team President Pat Riley assembled a superstar trio of free agents LeBron James and Chris Bosh joining Dwyane Wade. While Spoelstra was head coach, the Heat made four consecutive finals appearances including trips to the 2011, 2012, 2013, and 2014 NBA Finals, winning the championship in both 2012 and 2013. Born in Evanston, Illinois, Spoelstra later spent his childhood in Buffalo, New York then Portland, Oregon by the late 1970s. Spoelstra attended Jesuit High School in Beaverton, Oregon, where he excelled at point guard on the basketball team. He wore number 30 during high school and later in college in honor of then Trail Blazer Terry Porter, one of his favorite NBA players. Before his senior year, Spoelstra participated in Sonny Vaccaro's Nike All-Star camp in Princeton, New Jersey alongside future NBA players Alonzo Mourning, Shawn Kemp, Billy Owens, and Bobby Hurley. Spoelstra received basketball scholarship offers, and eventually accepted one from the University of Portland in his hometown. In 1989, he was named West Coast Conference freshman of the year. Spoelstra was the Pilots' starting point guard for four years, averaging 9.2 points, 4.4 assists, and 2.4 rebounds per game. He is a member of the school's 1,000-point club, and is among the Pilots' career leaders in several statistical categories. During a 1990 WCC Basketball Tournament game against Loyola Marymount, Spoelstra was on the court standing just a couple of yards away from Hank Gathers when Gathers collapsed and later died of a heart condition. Spoelstra graduated from the University of Portland in 1992 with a degree in communications. After graduating from the University of Portland, he was hired and spent two years (1993–1995) in Basketball Bundesliga's second division as a player–assistant coach for TuS Herten, a German professional basketball club based in Westphalia, Germany. It was in this setting where Spoelstra got his first coaching job, as coach of the club's local youth team. He began having back problems after the end of his second year with the team, and contemplated having surgery. In 1995, Spoelstra was offered another two-year contract with the club, but the NBA's Miami Heat also offered him a position. Although both offers held appeal, he chose to take the Heat position.